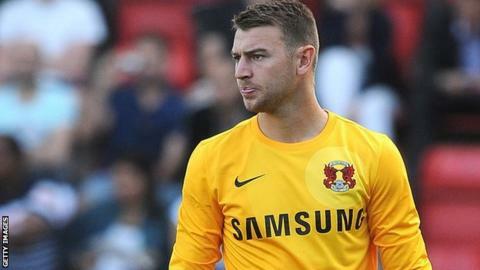 Police have arrested a man following an attack on Leyton Orient goalkeeper Jamie Jones during Saturday's game at Swindon. Wiltshire Police confirmed that a 26-year-old was in custody on suspicion of pitch invasion at the County Ground. An investigation into the incident, which led to a lengthy delay in the second half of the game, is ongoing. "That was the worst scene I've seen as a manager," Orient manager Russell Slade told BBC London 94.9. The London club won the game 3-1, a result which saw them return to the top of the League One table. However, Slade said the incident overshadowed the match. "It was a great win, but it was clouded by a fan running onto the pitch and throwing three punches at my goalkeeper," he said. "It is unbelievable. He's okay, but that doesn't make it right. It's outrageous. "He [the supporter] needs a ban for life. He should never go to another football match."